I wanted to take a few moments to acknowledge everyone who has helped make the first third (can you believe I am already a third of the way through the year?!?!?) of this year of chemo possible. There have been SOOOOO many fundraising events and people who have stepped up to help. I really appreciate everything that has been done! I am able to continue with my complimentary treatments (naturopath, acupuncture, and therapy) that keep me feeling good. I want to thank one of my best friends, Erin, who has hosted and organized countless events such as the recent Country Stomp. It was an awesome night, with great friends and such generosity. I also want to thank the ladies from my church who recently organized a progressive euchre tournament. Although I wasn’t able to attend it, I hear it was a blast as well! Thank you to everyone who donated, collected prizes, made food, and attended these two events. Thank you to all the donors who have sent me cheques or donated online, as well. Finally, I want to thank Bryan, Martha, Laura, and the Cutten Fields crew who are in the process of organizing a huge dinner and dance fundraiser for me. 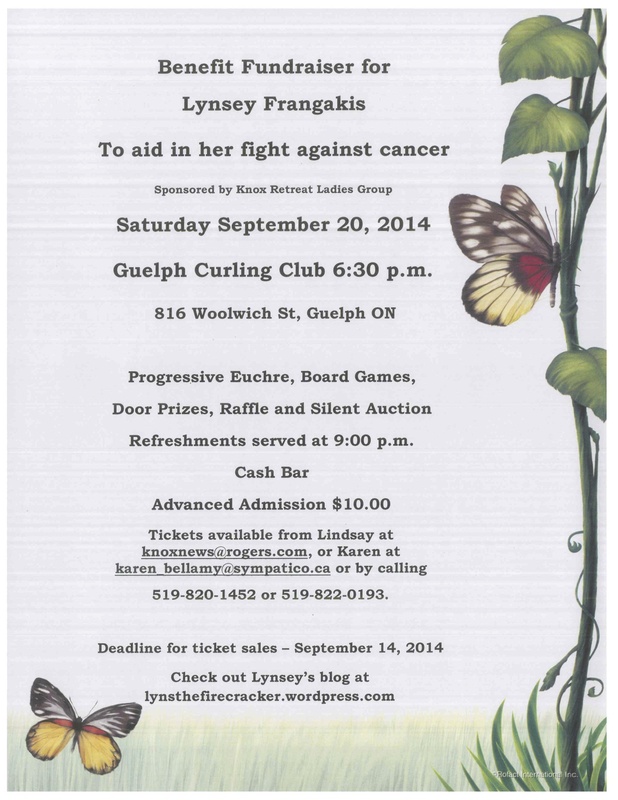 “Love for Lynsey” is coming up next Friday night and again promises to be a great night full of encouragement and love. The generosity of those attending has already been shown as the event sold out almost before it was advertised. I promise to post an update after this event. With all the amazing support coming my way I wanted to re-pay this generosity to the community. My friend Vanessa suggested doing something like I did for my birthday last year. So, this year I am going to try to do 26 for 26. 26 acts of kindness for my 26th birthday. However, this year I can’t do it alone. I hope to have 26 people help me by each doing one act of kindness on my birthday, October 28. Vanessa was the first to sign up and is donating her beautiful hair to make a wig for a cancer patient that day. The act can be anything…. donating food to a shelter, donating money, picking up garbage, volunteering, donating blood. If you are interested in participating please e-mail me at lynsey.hodgson@gmail.com and I will add your act of kindness to my birthday list. All I want for this birthday is to give back to the awesome community that has supported me so much once again this year. Thank you all for your never ending support and encouragement. Some friends are planning a progressive Euchre night next Saturday September 20th and I wanted to pass on a message from them. Hope you can also share with your family and friends and anyone who might be interested in attending. Thank you! We would love to have as many people come out on September 20th as possible – Euchre Players and Non-Euchre Players alike – there are games and events for EVERYONE!!!! Progressive Euchre starts at 7 pm, Games available for non-euchre folks, food served at 9 pm, Guelph Curling Club – Woolwich street, just behind Walmart! We have some amazing AMAZING Silent Auction prizes – handmade quilts, crocheted blankets, gift cards to a TON of places, massages, dance lessons, music lessons, decor items, sporting items, water softener, and tons more…..it’s pretty phenomenal!!! Come On out, there is something for everyone, and a great night of entertainment, food and fun! !